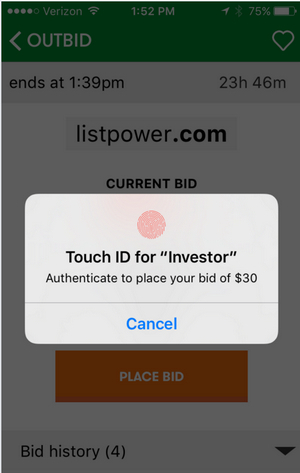 App makes on-the-go bidding easier, even if you use two-factor authentication. 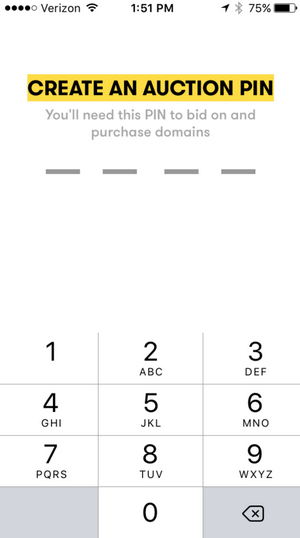 GoDaddy has launched a new domain name investor app for the iPhone and Android, making it easier to watch and bid on domain names at GoDaddy Auctions. Mike McLaughlin, GM for Domains at the company, announced the app release during his keynote address at NamesCon today in Las Vegas. The app’s functionality is fairly simple. But it’s certainly much faster than logging into GoDaddy’s mobile site to bid, especially since the app “solves” the problem of two-factor authentication. Two-factor authentication is only required once because the app sets up a bidding pin. First, you log in to your GoDaddy account. If you have two-factor authentication enabled, you’ll be asked to enter the authentication code. You can’t add new domains to your watchlist or bid on new domains unless you previously added them through the web interface. This is similar to the NameJet app. The apps are designed to make it easier to bid on-the-go rather than search for and add new domains to your lists. Just took a look and I agree that it’s an improvement but only a slight one. The filtering is pretty bad. For example, you can filter by price (low to high), listings with bids, and most active, but you can’t add more than one filter. That means you can’t see low priced listings with bids or high-priced listings with no bids. Hi Ryan, the issues on our mobile web Auctions site is exactly why we developed the native mobile app, I hope you’ll give it a try.